The next Club morning walk will be in Fernkloof Nature Reserve, offering an interesting variety of birds. That should include Orange-breasted and other Sunbirds (Oranjebors- en ander Suikerbekkies), Cape Grassbird (Grasvoël), Klaas’s Cuckoo (Meitjie), Cape Batis (Kaapse Bosbontrokkie), Acacia Pied Barbet (Bonthoutkapper) and some raptors. We meet in the lower parking area at 08:00 on Thursday 2 April. Bring along a snack and water. Visitors are welcome. Contact person: Craig Holmes at 083 227 9003. The new African Penguin and Seabird Sanctuary at Kleinbaai has already proved its worth, reports Club member Lee Burman. On Sunday, while working in her garden opposite Hermanus High School, a car stopped at her house, a guy got out and picked up a bird which, to her amazement, turned out to be a young Cape Cormorant (Trekduiker). 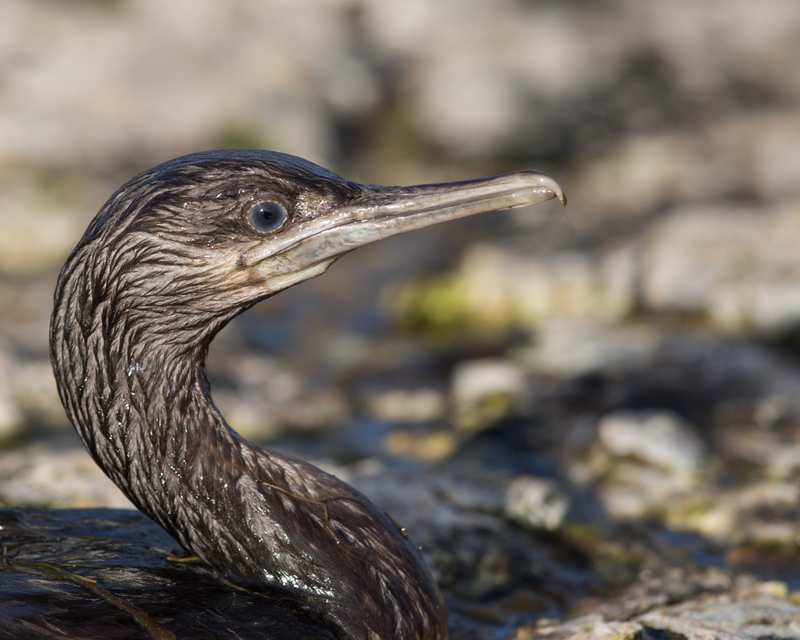 A young Cape Cormorant (Trekduiker) similar to the one found near Hermanus High School. “Wolf, which turned out to be the guy’s name, and I tried to return the Cormorant to its normal habitat,” Lee said. But at the shore were no other Cormorants and the bird showed no inclination to move off the rocks – just stumbled around looking somewhat disorientated. Lee took the bird with her, collected a couple of pilchards at The Fish Shoppe, then dumped the bird on a not too happy Club member Mike Ford. “But he warmed after seeing what an appealing youngster it was and managed to feed it a few bits of fish. To raise awareness of sparrows and the need to conserve general urban biodiversity, World Sparrow Day is celebrated today, 20 March 2015. The theme for this year’s World Sparrow Day is “I LOVE Sparrows”, and individuals and organisations are encouraged to visit the World Sparrow Day website at http://www.worldsparrowday.org to offer their support. “Together we can collectively inspire as many people as possible to conserve sparrows, other birds and their habitat across the planet,” said Dr Hanneline Smit-Robinson, Terrestrial Bird Conservation Programme Manager of BirdLife South Africa. Dramatic images of the plight and rescue operation of thousands of penguins covered in black oil were broadcast and published worldwide in the year 2000 after the bulk ore carrier MV Treasure had sunk close to Cape Town. Margaret Roestorf began her presentation at the Club’s first monthly meeting of the year with a video showing some of those images, refreshing the audience’s memory of that hectic operation. It also reminded Mike Ford, past Club president and bird-ringing guru, of his participation in the operation. You can read the report of Margaret’s presentation in the latest Oystercatcher by clicking on the link above. There are also reports of another presentation on bird-ringing by Mike, and of the Club visits to De Hoop and Rooi Els – and more. But there is something extra: By clicking on the link below, you can read how Mike became an instant expert at cleaning penguins as he tells it to SA Birdnet in his original emails during the rescue operation of 2000. Please note that the Club meeting at Fernkloof Reserve Hall on Wednesday 18 March, comprising the annual general meeting and a presentation by Jessie Walton, will begin at 18:30. That is half an hour earlier than the normal monthly meeting time. There are two good reasons not to miss this month’s Club meeting. Firstly, it is the annual general meeting (AGM) and secondly, the speaker will be Jessie Walton. Jessie, bird lover and researcher from Elgin, will give a presentation based on her research on a little bird that many birders may have seen but not recognized – the Brown-backed Honeybird (Skerpbek-heuningvoël). That will be followed by the AGM, including the election of a new Committee that will consist of at least three new faces. A vacancy needs to be filled, and two members are not available for re-elction. The meeting, at the Fernkloof Reserve Hall on Wednesday 18 March, will begin half an hour earlier, at 18:30. There will be drinks and snacks afterwards. Two Club members saw something extraordinary on an outing to Spookhuis near Stanford on Sunday. It was not the often reported lonely figure of a woman with parasol under nearby milkwood trees, looking like the unhappy heiress who had lived there a century ago. 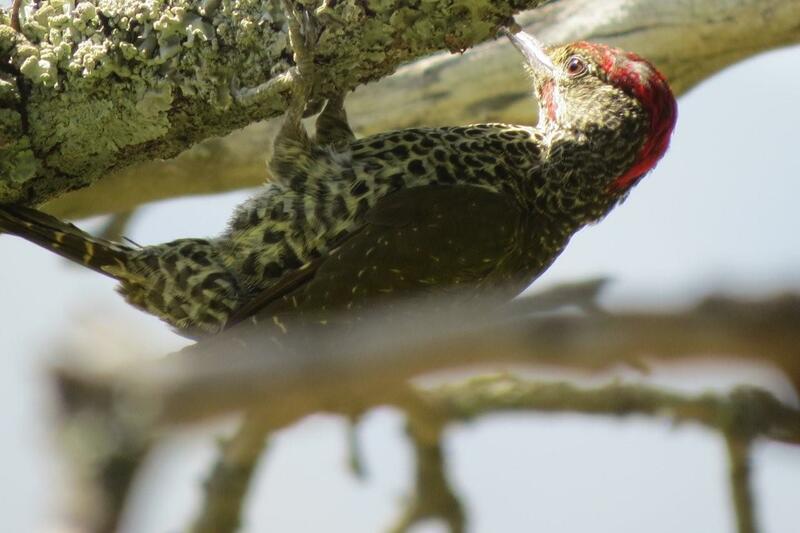 After a light lunch at the Spookhuis restaurant, Margie Ogston and Barbara Swart spotted an uncommon woodpecker hanging around among those same milkwoods. With the help of Margie’s photograph and the experienced Mike Ford, it was identified as a Knysna Woodpecker, which is a rarity in this area. So there is another good reason to visit Spookhuis – in addition to having a good lunch among various birds, experiencing the lovely setting of the huge three-story house on the edge of the Klein River lagoon, built in 1892 and turned into a restaurant since, and looking for the ghost of the unhappy Agnes Stroud with her parasol. The next Club morning walk will be in Stanford, where many Club members have attended the first ever Walker Bay Bird Fair over the last few days. Stanford was chosen for this outing because it falls within the Birding Challenge area for March. The walk, on Thursday 5 March, will be led by Graham and Barbara Palmer and Lee Burman. We depart from the Fernkloof Reserve parking area at 07:30. Bring along a snack and water. Visitors are welcome.